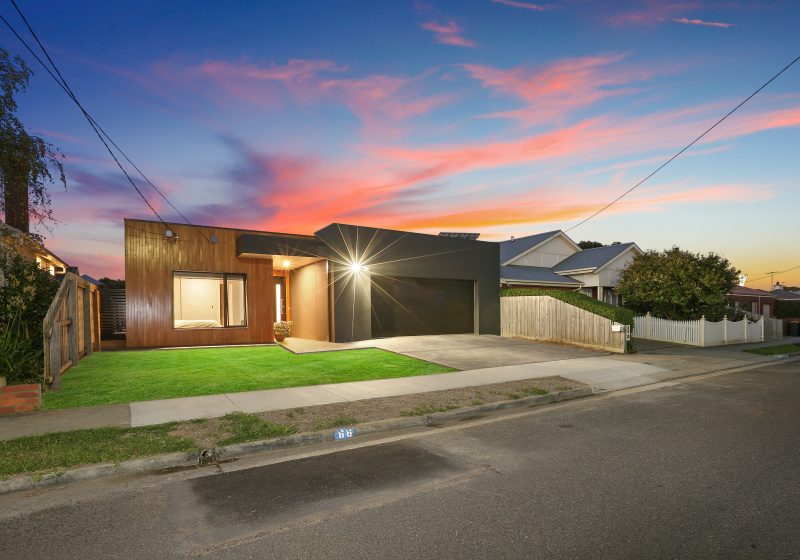 After we announced on social media channels our recent success at the Master Builders Association (MBAV) Regional Building Awards we received messages from our community wanting to see photos of the winning home. ​​​​​​​We were announced winners of the MBAV Western Victoria Best Custom Home $500-600,000 for a Newtown Home. We are so excited to share photos of the winning home with you here. 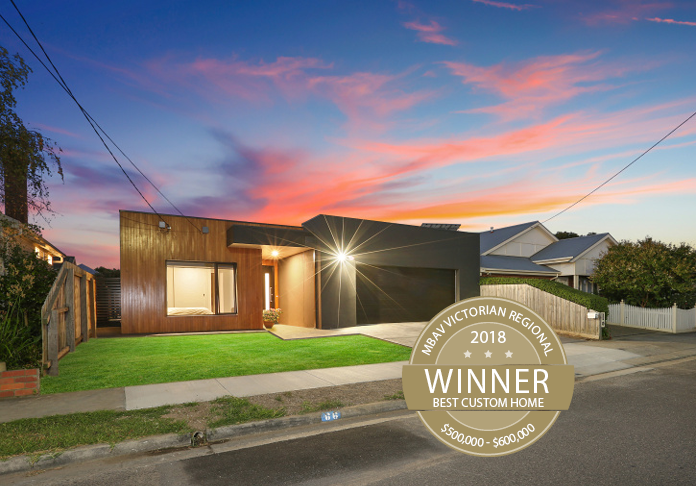 We firstly would like to take the opportunity to publicly thank our beautiful clients; thank you for trusting us to design and build your forever home, and for then allowing us the privilege to share our work by entering your home into the award program for 2018. 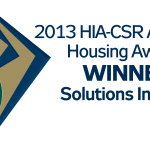 Winning Best Custom Home is recognition from our industry association for our team of staff and subcontractors onsite. They are a group of professionals who dedicate their time and expertise to delivering quality in the service we provide and utmost quality in our construction. Our mission is too deliver a home both our clients and us as a business are proud of. The awards are judged against key criteria being: quality of workmanship, design effectiveness, visual appeal, innovation, environmental sustainability, client relationship and value for money. 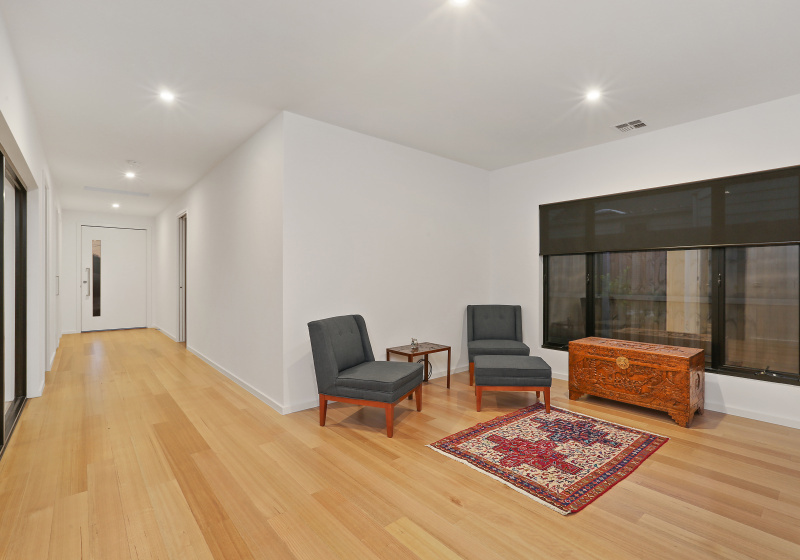 Daniel van den Ham our in-house architect unwavering passion to provide an architectural design that responds to our clients’ lifestyles and the way they live is always so evident in all our finished product. 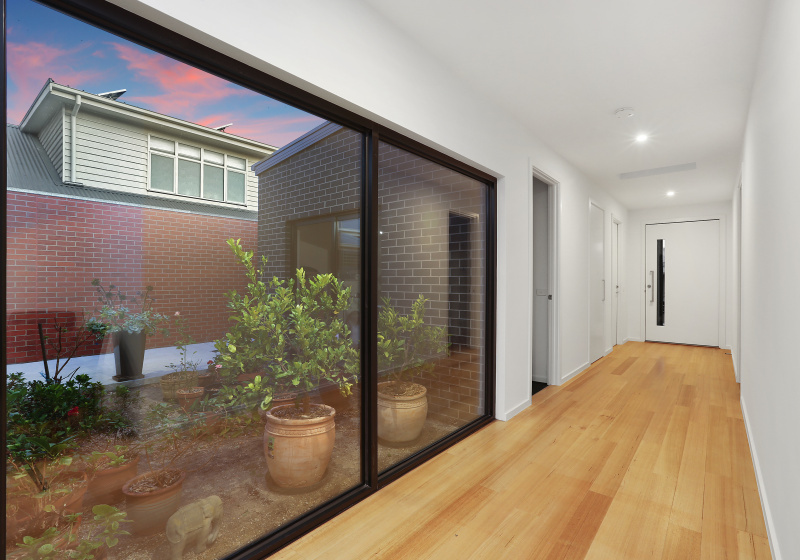 Daniel designs with orientation being a key consideration; the footprint of this award winning Newtown home allows extensive north facing glazing (flooding natural light) to be integrated through the design. The change in ceiling levels and raked ceiling, creates a sense of volume and space. 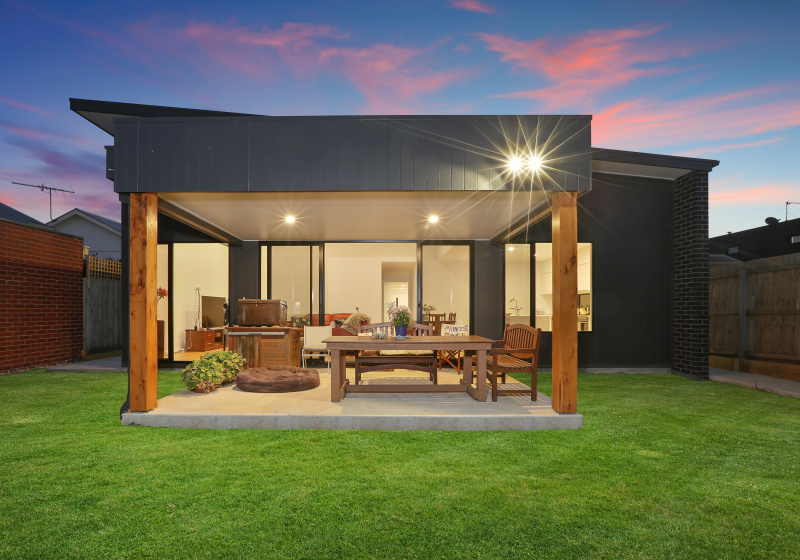 Inspiration for the design was partly drawn from our Coastside drive display home where the clients liked the garden courtyard area. 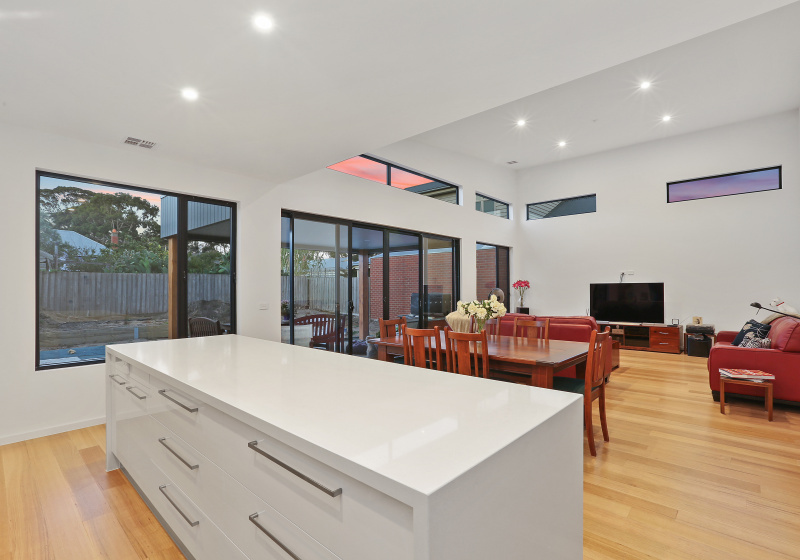 Natural light is a key expression throughout the home and the trend is evident at the entry with a skylight. Upon entering the home to the left is a separate wing; hosting 2 spare bedrooms serviced by well-appointed bathroom. This zone is for when family come to stay but as it is not used by our empty nester clients on a regular occasion it has been designed to shut off the space. A coats cupboard in in close proximity to the two entry points of the home so the owners or guests can hang their coat, hat and umbrella and leave their bags after a day’s work. A gym is opposite the guest zone followed by the garden courtyard. The garden courtyard is viewed from the gym, entry/lounge and master bedroom. 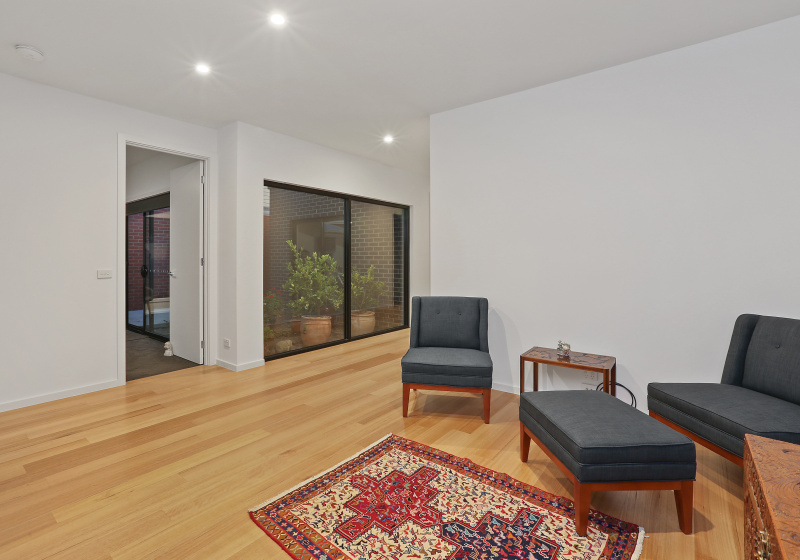 A grand 3metre wide x 2.1m window that meets the finished floor in the entry provides picturesque aspects to the garden courtyard. The light filled home places design emphasis on the garden courtyard. The master bedroom exudes feelings of peace, the owners retreat is enhanced as they look out onto the greenery of their garden courtyard. The environment is best described by the overwhelming serenity it radiates. 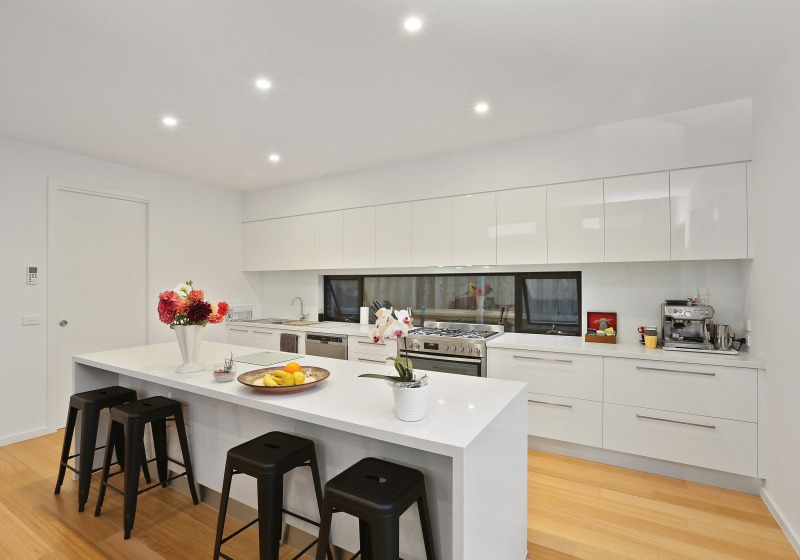 Extending the full width of the home at the end of the entry is the kitchen, dining and living area. A change to the roof line brings about the ability to provide higher ceilings. Lofty raked ceiling extending a massive 4.22 metres at its peak provides a greater sense of spaciousness and volume. 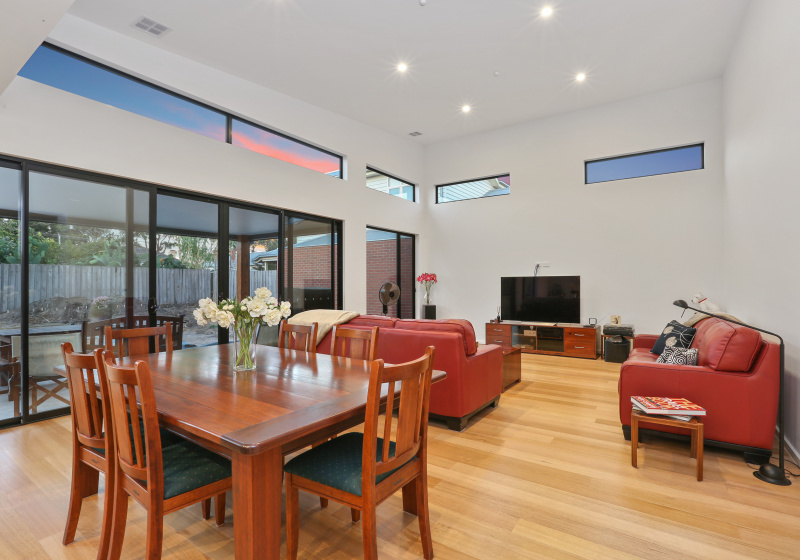 Most importantly the key design feature to the north facing living allows for highlight windows allowing natural light to permeate the home. A strong connection to the backyard has been accomplished and an adjoining alfresco instantly enriches the functionality of the home. 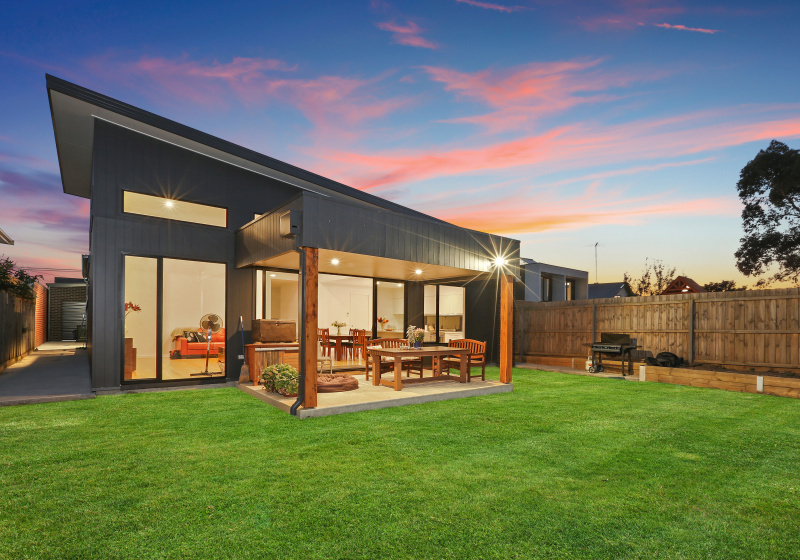 Bi-parting 4 metre wide sliding door opens from the dining to the alfresco creating the indoor-outdoor entertaining connection. Nestled in an established area, the 609m2 allotment was a narrow 13.5metres wide frontage. A striking contemporary frontage and bold choice of colour with black render and a black slimline design garage door forming one visual element to the right. The choice in colour emphasises the garage form and is a good example of the modernist principle of “clean lines”. The façade is characterised by the square parapet walls concealing the 6 degree pitched roof plane that exists behind the top of the wall. 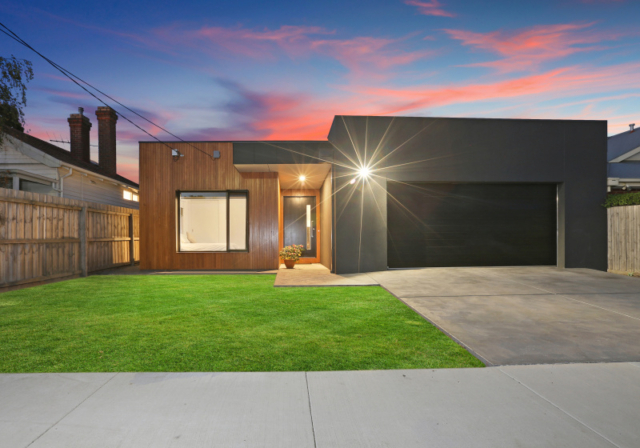 Vertical blackbutt timber cladding to the left of the entry exudes warmth and brings a neutral element against the dramatic night sky black creating the perfect contrast. 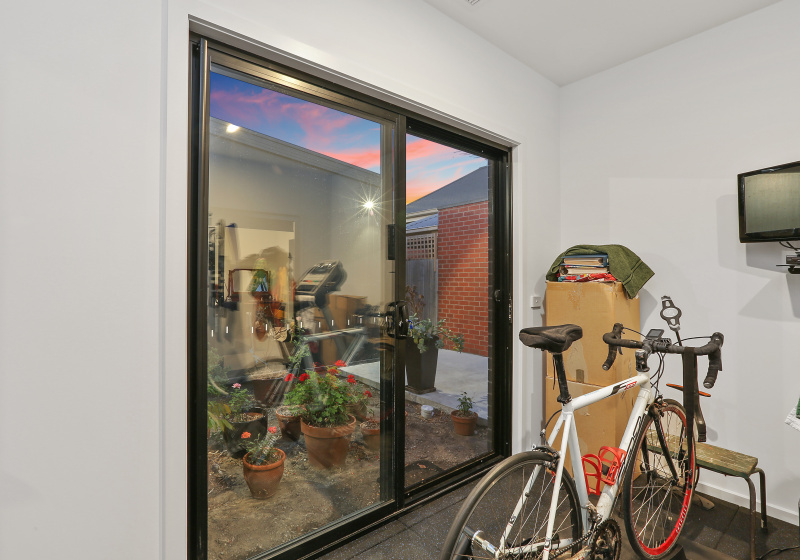 2100mm x 1800mm window to the timber area features a black night sky metal reveal interrupting a seemingly flat façade and provides connection between the two elements. The metal eyebrow articulates the window design drawing attention to the window openings impressive 1500mm uninterrupted fixed panel. At Signature Homes our promise is to design a home you are proud of. Just like this award winning home the journey all begins with a FREE design consultation session with our award winning in-house Architect. We help our clients create the best custom home for their budget. Free Architect Design Consultations are subject to availability and strictly limited to two appointments per week. If you haven’t already secured a free design session with our in-house architect, contact us today 5229 2929. That’s great, we are happy to show them off as we are super proud. If you would like to see more of our work stick around on our website and have a look around. 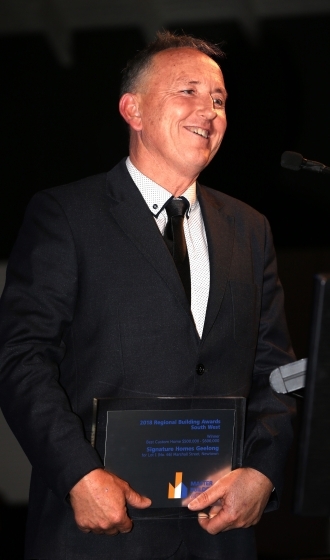 Maybe the article on last year’s award winning homes would interest you, if so click here. Or are you wondering if we build split level homes? Find your answer here. Reach out we are happy to assist where we can, leave any questions you still have on our contact us page and we will be in touch. Or place feel free to call us directly on 5229 2929.